It’s been a quarter of a century since the Keating government introduced a retirement-income package in 1992 and Vince Fitzgerald reported on national savings in 1993. 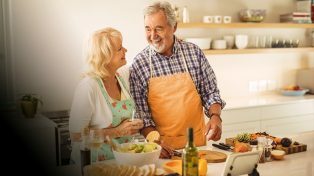 For a generation, Australian retirement incomes policy has been dominated by their assumptions. We’ve had a generation of policy thinkers who assumed that people won’t have enough money in retirement. Many fear retirees will be financially insecure, and that the federal budget will not be able to maintain the age pension, which in any case would leave many impoverished. Their solution is a high superannuation guarantee (at least 12 per cent, possibly 15 per cent, of wages), which would ideally be converted at retirement into a lifetime annuity. So our recent report showing that most Australians are already saving enough for a comfortable retirement came as a shock to the old guard. 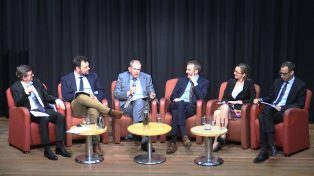 As is often the case when fundamental assumptions are questioned, and legacies are at stake, the rhetoric has become more heated, and analysis less careful, as with Andrew Podger’s article in the Informant in December, and Paul Keating’s interview on 7.30 in November. Our most upsetting finding was that Australia’s retirement-income system is already doing its job. Rather than make assumptions about what constitutes a “comfortable” retirement, or repeat assertions that there is a crisis, we looked at how retirees’ actual income and spending compared to the income and spending for the same cohort 20 years ago, before they retired. We found that, across the income distribution, retirees today typically have enough money to sustain the same, or a higher, living standard in retirement as when working. Subjectively, most retirees today feel more comfortable financially than younger Australians who are still working. 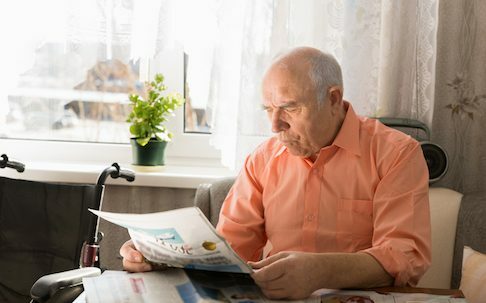 Some retirees are experiencing financial stress, especially if they rent, but rates of financial stress are much lower than for people of working age. The retirees of tomorrow are likely to be even better off, given higher compulsory super contributions, non-super savings, and an age pension indexed to wages. We set up a model to test this logic, and it shows that, even after allowing for inflation, the typical worker today can expect a retirement income of at least 91 per cent of their pre-retirement income – well above the 70 per cent benchmark endorsed by the OECD, which delivers (at least for home owners) an equivalent standard of living post-retirement. Many low-income Australians will get a rise in pay when they retire, because the age pension and the income they get from compulsory retirement savings will be higher than their pre-retirement earnings. Podger and other critics of our work have largely responded by throwing dust into the model, thinking that this will obscure its core findings. We made it easier for them to do so, because we spelt out our assumptions in detail. Most other work in this field is at best sketchy about methodology — and occasionally silent on issues that turn out to be crucial to the results. In fact, the Committee for Sustainable Retirement Incomes researchthat Podger cites is perhaps the worst offender in this regard. It doesn’t even say what investment returns are assumed. Any modelling exercise makes assumptions that are debatable. Podger raises a series of technical issues: non-super savings might be lower; higher compulsory super savings might reduce voluntary savings more; and people might draw down more on non-super savings. But the key question for economic modelling is “which assumptions make a material difference?” Even if we assume no voluntary savings, the bottom 70 per cent of income earners will still have economic resources to fund a better lifestyle after retirement than before – as shown by the sensitivity analyses that we included in our report. We think we are perfectly justified in making the assumptions that Podger and others attack, but in any case they just don’t matter very much for the bottom 70 per cent. And the top 30 per cent are precisely the people who, in practice, tend to have the most material voluntary savings. So why do other modelling exercises, such as the committee research cited by Podger, conclude that an increase in the superannuation guarantee to 12 per cent is crucial to adequate retirement incomes? It’s because a generation of modellers made an assumption that turns out to matter a lot. They calculate replacement rates by assuming that retirement incomes should keep pace with the wages of younger workers, rather than just keeping pace with inflation. As shown in our report, this reduces replacement rates by about 14 percentage points – a much bigger effect than any other assumption we analysed. The old generation of thinking about retirement incomes has ignored reality. Retired Australians tend to spend less as they age, even when they have money to spare. 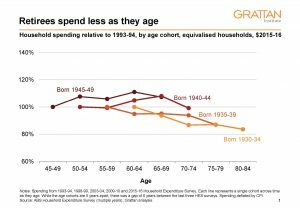 Spending tends to slow at about the age of 70, and falls rapidly after age 80, to just 84 per cent of what was spent at retirement age, after adjusting for inflation. Even the wealthiest retirees tend to spend less as they age. Most international studies come to the same conclusion. Not only do most retirees not draw down their savings throughout retirement, many add to them. Even among pensioners, one recent study found that the median (typical) pensioner still had 90 per cent of what he or she retired on eight years later. This previous generation of modelling implicitly assumed that a retiree needs to spend 22 per cent more at age 90 than at age 70, after accounting for inflation. Yet our research shows that spending typically falls by 15 per cent over that period. The previous generation of modellers (outside of the Treasury, which never fell into this trap) needs to change this critical assumption to reflect lived experience. Retirement incomes should be compared with pre-retirement incomes, adjusted for price inflation, not wage inflation. As soon as they do so, the assumed need to increase the super guarantee will disappear. The previous generation has also favoured a theory that tax arrangements should be analysed relative to a universal expenditure tax. They argue that superannuation tax concessions don’t cost very much relative to this baseline. And consequently, the argument goes, super doesn’t cost the budget very much. But in real life, an increase to the compulsory super guarantee levy will mean there will be about $2 billion less in the Treasury each year. Instead of workers receiving wages that are taxed at full marginal rates of personal income tax, the extra compulsory contributions to their super fund will be taxed at 15 per cent. Podger says this is based on a “false assumption”, but our claim that increasing the guarantee will reduce budget balances by about $2 billion a year is in line with how the Treasury has treated changes to the guarantee levy in previous budgets. Finally, we need generational change in thinking about money after retirement. Many in the previous generation of retirement incomes experts assumed that nirvana would be large super savings that were converted on retirement into a lifetime annuity. This would mirror the extremely generous public sector superannuation schemes that were grandfathered about 15 years ago because the Treasury couldn’t afford them. But again, analysis of reality is overturning long-held assumptions. It’s true that some people are worried about how long they will live, and whether their retirement savings will last. But it turns out that many more are worried about needing to pay unpredictable lump sums for health and aged care. They may have a point: spending patterns in retirement tend to be quite volatile from year to year. A steady annuity doesn’t help much; rather, a lump sum that can be drawn down as needed is much more useful. A previous generation of assumptions about retirement incomes turn out to be wrong. Post-retirement incomes are already comparable to pre-retirement incomes – and are likely to continue to be so. Spending in retirement doesn’t increase in line with wages – it typically falls in real terms. Increases in the super guarantee cost the budget a lot of money – far more than they savein age pensions. And once retired, most people prefer a lot of flexibility in their spending from year to year, rather than being tied to a fixed annuity. Public policy should be based on the best evidence we have. As time goes by, the evidence gets better, and we can test long-held assumptions. If they turn out to be wrong, then we should change the policy accordingly.